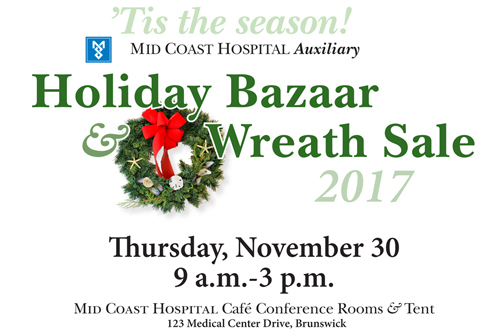 The Mid Coast Hospital Auxiliary invites you to the 2017 Holiday Bazaar & Wreath Sale on Thursday, November 30 from 9 a.m. to 3 p.m. The event will take place at the Mid Coast Hospital Café Conference Rooms and Tent at 123 Medical Center Drive, Brunswick. To order wreaths, please call (207) 373-6020 no later than Tuesday, November 28. Wreaths with cones or shells are $30 each; with a red bow are $12; and without a bow are $10. Proceeds benefit hospital projects. Wreaths may be picked up during bazaar hours. 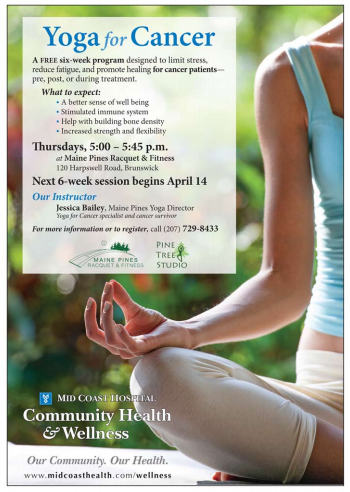 Mid Coast Hospital and Maine Pines Racquet & Fitness are again partnering to offer a yoga program designed to limit stress, reduce fatigue, and promote healing for cancer patients. “Yoga for Cancer” takes place weekly, beginning September 21 . It is free and open to cancer patients before, after, or during treatment. Research suggests that yoga can improve the symptoms of cancer and cancer treatment, while helping patients cope. Benefits include a decrease in fatigue, pain, and anxiety as well as an increase in appetite, better quality sleep, and improved bone density. 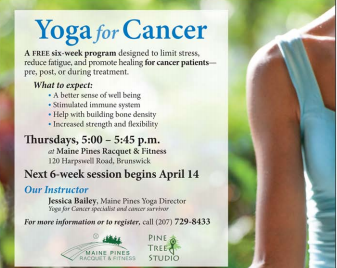 The Yoga for Cancer program will help cancer patients develop a better sense of well being, stimulate the immune system, and increase flexibility and strength. Register at Maine Pines, 120 Harpswell Road in Brunswick, or by calling (207) 729-8433. Science Fiction or Science Fact: Can Robots Take Over the World? Professor Eric Chown, of Bowdoin College Computer Science Department will give an entertaining presentation on the depiction of robots in science fiction books, TV and film, and explain the current state of artificial intelligence.